The past few years have given us a quite a few re-imaginings of classic fairy tales. While the gold standard among these is Fables, a long running comic book series (with quite a few spinoffs) by Bill Willingham, other examples include the Grimm's Fairy Tales comic series by Zenoscope Entertainment, the video games "American McGee's Alice" and "Alice: Madness Returns", the TV series "Once Upon a Time" on ABC, and recent films such as "Snow White and the Huntsman", "Red Riding Hood", and "The Brothers Grimm". It seems like both creators and fans enjoy seeing childhood stories come to life in darker, more sinister ways. "Hansel & Gretel: Witch Hunters" takes the original German fairy tale and explores what happened to the titular siblings afterwards, adding in plenty of blood and action along the way. And diabetes. You can't eat a house made of candy without factoring in diabetes. The film begins like the classic story: Hansel and Gretel are young siblings lead out into the woods by their father and abandoned. They eventually discover a house made of candy and enter it, only to find a nasty old witch. She locks Hansel up in a cage and forces him to eat candy while using Gretel as a slave. Eventually the siblings manage to kill the witch by placing her in the oven in which she herself was going to cook Hansel. We all know that part of the story and have probably heard it hundreds of times as children. 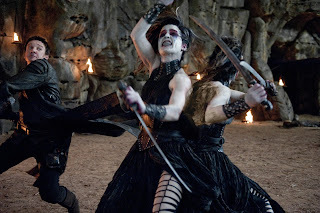 Hansel Gretel: Witch Hunters continues on, however, and tells us what happened to Hansel and Gretel when they left the witch's house. Wandering the German countryside and now inexplicably immune to the spells of witches, Hansel and Gretel (played by Jeremy Renner and Gemma Arterton) decide to take up the business of witch hunting for profit. Their story and reputation have become legendary, leading to their hiring by the mayor of Augsburg in order to deal with the city's witch problem. There have been an alarming number of children who have gone missing and witches are suspected. Sounds simple, right? Of course not. It turns out that rather than just killing a few average witches, the siblings have to deal with a town who wants to burn an innocent girl they believe to be a witch (Mina, played by Pihla Viitala), an uncooperative local Sheriff (played by Peter Stormare), trolls, an adoring fanboy with a thing for Gretel, Hansel's diabetes, exploding people, secrets from their past, and Muriel (Famke Jansen), an extremely powerful witch with plans to make herself and all witches forever immune to fire. (Fire is basically witch Kryptonite.) Famke Jansen doesn't get much screen time to fully let her character's motivations develop, but she does get the opportunity to display both her charm and her malice. The film contains a few twists that pop up later in the film, although you might guess most of them before the characters do. 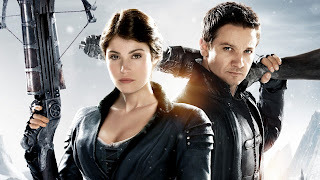 Both Jeremy Renner and Gemma Arterton have been establishing themselves as capable action stars. While Renner's action movie skills are pretty solid (especially when using a bow), he does seem to be having fun playing a straight character amidst all of the movie's absurd happenings. Arterton first caught my eye as Agent Fields in Quantum of Solace and proves here to be not only lovely, but also fully capable of handling herself in tough situations. I don't want to spoil anything for you, but Gretel pretty much bites off a guy's nose at one point. Yup. She's amazing. 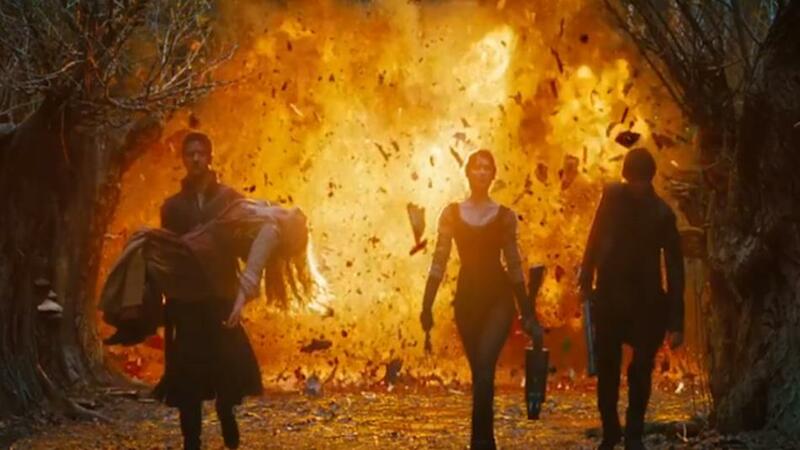 Anyways, both Renner and Arterton play their parts very seriously while doing ridiculously awesome things, which I think gives the movie part of its charm (although I imagine it bothers some people). Every time they're getting ready to kill something, I was just waiting to see what cool witch-killing gadget they'd pull out next. The design of the weapons is awesome and very steampunkish, especially a crossbow that shoots in three directions.
" Hey Hansel, where's Gretel?" Oh, there she is. Directed by Norwegian filmmaker Tommy Wirkola (Dead Snow), Hansel and Gretel is a rapidly paced film that's sole purpose is to entertain. The movie was beautifully shot (mostly shot on location in Germany outside of traditional studios) and really captures the haunted, old world vibe that works so well in a fairy tale film. While I did not see the movie in 3-D (as I usually don't like 3-D films) I was still fully satisfied. The film takes such joy in promoting its locales, fight scenes, and cool gadgets that it often feels like a comic book or video game. That's not a knock against the film; it simply knows that its here to entertain us with its creepy, fun atmosphere. While the movie has some slightly creepy moments and lots of bloody action, it also has a very self aware, almost tongue-in-cheek sense of humor. I still find myself chuckling over a sight gag where we see the drawings of missing children attached to bottles of milk. Goofy little anachronisms like this just help to spell out that despite the serious appearance of things, this film just wants to have fun. Witch fact of the day #4: Witches hate shovels. Watching the movie, I was reminded of three movies I really enjoyed (and one movie I didn't). First, the setting just overall reminded me of "The Brothers Grimm", which makes sense. Secondly, The way that the main characters are portrayed as slightly overconfident rogues who show up in town to kill monsters certainly had me constantly thinking of both "Army of Darkness" and "John Carpenter's Vampires", two of my favorite films. The witches move supernaturally fast and agilely like in "Army of Darkness" and the witches' plot reminded me somewhat of the vampire's plot in "John Carpenter's Vampires". Maybe I'm just a sucker for movies about folks hunting down supernatural creatures? For horror fans willing to give something different a try, Hansel and Gretel: Witch Hunters has plenty to offer. There are some excellent gore effects, along with the traditionally creepy settings. I also feel compelled to mention the fantastic character and costume designs for the film's witches. 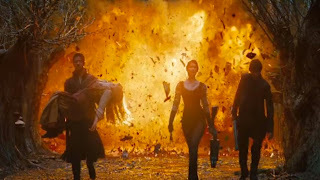 A scene near the end of the film offers a veritable coven of unique and creepy witches that are all very unique and creative. 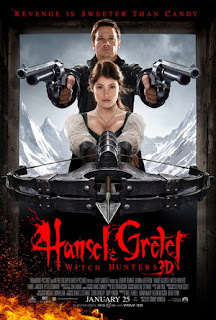 Hansel is not a fan of "Twitches"
Overall, I'm giving Hansel and Gretel: Witch Hunters 4 out of 5 stars. Sometimes you just see a movie that hits all the right chords and you feel like it was made specifically for you. That's kind of how I felt watching this movie. I had a blast it and certainly plan to snag it on Blu-ray.  That's perhaps one of the best compliments I can give to a movie, as it means that I can see myself sitting down and wanting to watch this movie again from time to time. This movie isn't going to change your life, but if you go in wanting to watch an action/horror film with a slightly dark sense of humor, you should be satisfied. 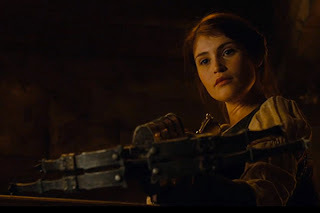 Gemma Arterton wielding an automatic crossbow and hunting witches? Automatic 4 stars!!! When not hunting witches or telling Hansel how cool his stories are, Barbecue17 writes reviews for action figures and Lego sets on Amazon.com.